Fraudsters are making increasing profits from a scam in which people are tricked into allowing their bank card to be sent straight to the conmen. Victims are caught out by phone calls which suggest their credit or debit card needs replacing owing to fraud on their account. A courier is dispatched to collect the card and the victim is told to key in their Pin on the phone. Some £1.5m has been stolen, with losses accelerating. Around £750,000 was stolen during the first four months of the year, the same as the whole of 2011. "If you become a victim of this type of crime, you should contact your bank in the first instance," said Det Ch Insp Paul Barnard, of the Dedicated Cheque and Plastic Crime Unit. "If you have friends or relatives who you feel may be vulnerable to this, please help them to be more aware of the potential risks and what to look out for. Remember, if you are the innocent victim of card fraud you will not suffer any financial loss." The scam starts with the victim, often an older person, receiving an unsolicited call from someone claiming to be from their bank and suggesting their card needs replacing. 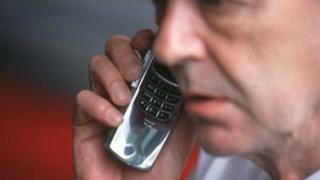 The caller often suggests the person hangs up and calls the bank back if they want to ensure the call is genuine. However, by giving a bogus number or staying on the line, the fraudster can then pretend to be from the bank. The caller will then ask the victim to key in their Pin, before sending a courier to collect the card, which is then delivered straight to the fraudster who now has the Pin. The UK Payments Council urged people to never to hand over their card to somebody who wants to collect it, and never to share their four-digit Pin with anyone else. Victims of scams such as these are refunded losses by the card provider, unless they are playing an active, knowing part in the scam.